My family and I are struggling to absorb and find room for all the stuff that arrived with Christmas. I actually lie awake at night wondering where I am going to put it all. Content with our abundance, I draw the warm covers tight about me and ponder the cold winter night outside. And I think of the friar. Is he walking the fallow fields between the towns that dot our valley? Is he cold? Did he have enough to eat today? Did he fall prey to ruthless men? 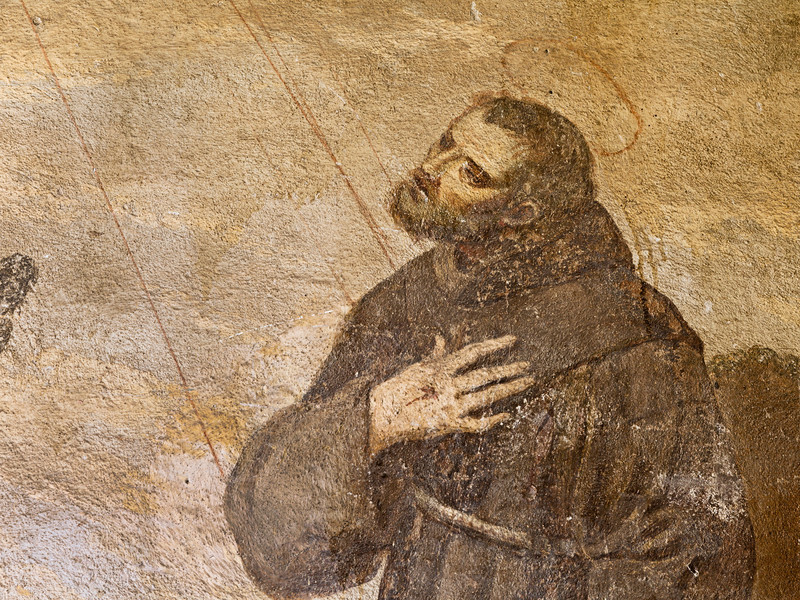 I am haunted by an image — almost a memory — of a modern-day St. Francis. I never personally encountered the friar, but my parish priest and many people in town did. Father told us about it at a recent Sunday Mass. On a cold winter night, Father was giving a lesson in the church to a group of catechumens, people being prepared for baptism. When the class resumed, Father noticed a young, bearded man in a back pew dressed in a cassock, which appeared to be cut from army surplus cloth. The friar left the church before the lesson was finished. After class, when everyone had gone home, Father found the friar sitting on the porch of a little house behind the church, a property owned by the parish. “I am a follower of St. Francis,” the friar answered. As Father sensed the man’s sincerity, he became embarrassed about his earlier doubts and pushed the stick as far behind him as he could. Father offered the friar a bed for the night. He refused, explaining that he chose to live as the poor and homeless, but he would appreciate being permitted to sleep on the front porch of the little house. The priest asked if he would like a meal. Again, the man refused, saying he had eaten all the food he would eat that day. He pointed to a small plastic bag and further explained that he had already gathered his food for the following day. Finally, the priest asked the man if he might like a cup of coffee in the morning. The man gently declined, but did request one favor from the priest — that he would hear his confession before the following morning’s Mass — which the priest granted him. Many people in town saw or heard about the man, and he was last seen walking a country road toward another town. I have no idea if he is out there still. Madman or saint? I am skeptical enough to think he might indeed be mad, yet hopeful enough to think him a saint. And every once and awhile, especially on cold winter nights, I send a little prayer his way in hopes of warming him.